Minewaki Ikuo, CEO of Tower Records, is also well known for being a Kumai-chan wota. Something he's particularly notorious for is his collection of Kumaicho photos. It's not just that he collects photos of Kumai-chan, but his collection also includes photos that don't directly have Kumai-chan in focus. 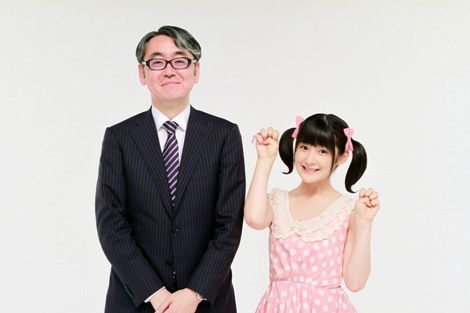 For an example of what I'm talking about, take a look at the picture of lovely little Momochi below. Now note the helpful little arrow pointing out Kumai-chan in the background. Yes, his collection also spans to include pictures like these. Another corporate head who's also notable for his support towards a H!P Kids act would be the president of Pizza-La, who supported Buono! by sponsoring their radio show, providing them appearances on commercials, and even a short concert tour. I became this much of a Kumai-chan oshi from 2005. Before that, I had been moved by the movie 'Koinu Dan no Monogatari' that the members of Berryz had appeared on when they were Kids, and bought photos of Saki-chan and Momochi during their performances together with W. But this one time when I was buying Morning Musume。 and Melon Kinenbi photos, there was a photo of a really cute girl sparkling brilliantly. Upon seeing it, I suddenly thought 'Eh? ', it was Kumai-chan. Ever since then, I've been collecting photos of Kumai-chan through the Hello! Shop, and I re-watched their DVDs. Kumai-chan really has this air of playing innocent, and I got more and more interested in her. And so, I had an oshihen pilgrimage. The Nippon Budokan from two years back left an impression on me. It was so great, it's like there couldn't be a greater moment of joy. If you were to ask me 'What's the best H!P concert? ', even looking back upon the complete history of H!P, I'd answer with Berryz' first Budokan. It was sheer joy. Like 'Ah, it's great that I fell in love with Berryz'. With the August announcement of their hiatus, I've been introducing Berryz' songs through Twitter. Berryz are definitely what got me so into idols until now, and T-Palette might not be around if those girls hadn't been there. I originally got my foot in because of Morning Musume。, but I've bought lots of photos following along on tours, and in a year I purchase 1,500 photos of Kumai-chan. Berryz were the ones who showed me the path of being an idol fan. It's difficult for a fan to return the favour, but when I thought about it, I thought that I should get as many people as possible to listen to Berryz' songs since they're wonderful. Since many of my followers on Twitter are fans of other idols, it would be nice if even a single person gets newly influenced. I guess that would be repaying the favour. Well, there's been talk that I could have done more as a CEO, but I think that it's important to get as many people as possible to listen to their songs. Hello! Project's songs make me think that Tsunku♂-san definitely is great, his songs are fun to listen to, and don't grow stale. Even the songs from the early days are still a great listen, it would be nice to look back on them. While being filled with all sorts of emotions, I think that's what the girls can do. They came out with 'Futsuu, Idol 10nen yatterannai desho!?' and when I was thinking that they'd be going on for another 10 years, they entered their hiatus. I was surprised, to say the least, but since they themselves made the decision, it doesn't feel sad. I might be overcome by emotion at the last concert, but now I'm in cheering mode. And I think the choice of the word hiatus was good. It would be the end if they said they were breaking up, but in this case, they might resume someday, they could come back at any time.